Bulldog Powerlite Cable Laying Shovel 5CLPL. The Bulldog PowerLite Cable Laying Shovel is hard wearing, light and above all safe. The slightly dished blade & round cutting edges are designed for clay digging. 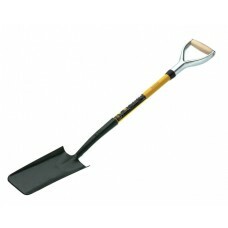 The Bulldog Powerlite Cable Laying Shovel is also excellent for heavy ground breaking work. Bend strength exceeds the BS3388 Standard.